"During the first seventy years of the twentieth century, the high school graduation rate of teenagers in the United States rose from 6 percent to 80 percent. A result of this remarkable trend was that, by the late 1960s, the U.S. high school graduation rate ranked first among countries in the Organisation for Economic Co-operation and Development (OECD). The increase in the proportion of the labor force that had graduated from high school was an important force that fueled economic growth and rising incomes during the twentieth century. Between 1970 and 2000, the high school graduation rate in the United States stagnated. In contrast, the secondary school graduation rate in many other OECD countries increased markedly during this period. A consequence is that, in 2000, the high school graduation rate in the United States ranked thirteenth among nineteen OECD countries. Until quite recently, it appeared that the stagnation of the U.S. high school graduation rate had continued into the twenty-first century. However, evidence from two independent sources shows that the graduation rate increased substantially between 2000 and 2010. This increase prevented the United States from losing further ground relative to other OECD countries in preparing a skilled workforce. But graduation rates in other OECD countries also increased during that decade. As a result, the U.S. high school graduation rate in 2010 was still below the OECD average." Here's a figure showing the patterns. The horizontal axis shows (approximate) birth year. 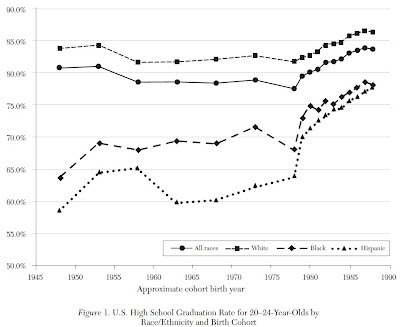 The vertical axis shows the high school graduation rate for those who were 20-24 at the time. Thus, for example, the upward movement of the graph for those born around 1980 is based on data when those people had reached the age of 20-24. 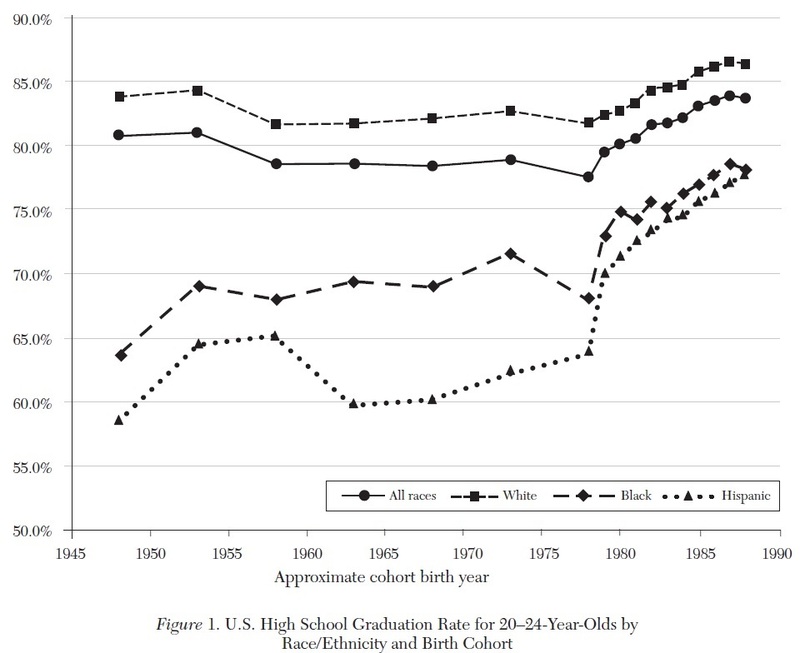 Why the stagnation in high school graduation rates from 1970 up to about 2000? Clearly, it's not because the labor market rewards to getting a high school degree had declined; in fact, the gains from a high school degree had increased. 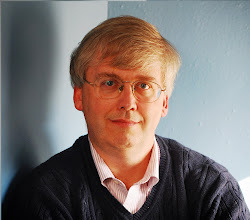 Research has looked at explanations especially relevant at certain places and time, like a boom in demand for Appalachian coal in the 1970s that might have made a high school degree look less value to lower-skilled labor in that area, or how the crack epidemic of the late 1980s and early 1990s altered the expected rewards to finishing high school for a group of young men in certain inner cities, or how the end of certain court-ordered desegregation plans led to higher dropout rates for some at-risk youth. rates over the last decades of the twentieth century." legislate increases in graduation requirements." My own concern about high school graduation requirements is that they are too often focused on getting a student into a college, any college, rather than moving the student toward a career. A high school student in the 25th percentile of a class should still be able to graduate from high school. But while some students who performed poorly in high school will shine in college--and should have an opportunity to do so--it is an unforgiving fact that many students at the bottom of the high school performance distribution will have little interest or aptitude in signing up for more schooling.